Whether you're working on a new build or conversion project for either residential or commercial properties, air tightness testing is vital to ensure airtight facilities and superior ventilation. At Falcon Energy, we have years of experience at performing such tests on a range of properties across West and East Sussex, Surrey, Kent and nationwide. Air tightness or pressure testing is a skilled method of determining uncontrolled airflow, air leakage and unwanted drafts at a property which may result in heat loss. As such, a property would not be deemed environmentally friendly and could prove expensive to run. Since April 2006, new build and conversion properties have been required by law to comply with Part L of the Building Regulations. This states that the properties must undergo air tightness testing to ensure that they meet the standards of energy efficiency and do not have a high percentage of heat loss through the home. By thoroughly tracing and monitoring air pressure and leakage, such heat loss can be eradicated along with the risk of CO2 emissions; a key principal of modern building regulations. Depending on what type of property you have and the amount of homes in a development, the process to air tightness testing can differ slightly. Air tightness testing is only undertaken in a portion of homes within a development, and if they all pass then there is no need for further tests to be undertaken. Why work with Falcon Energy? Our expert team of technicians are fully qualified and affiliated to IATS (Independent Airtightness Testing Scheme), in addition to being highly skilled and extensively experienced at performing such rigorous, thorough testing. With our team being recognised by IATS, you're guaranteed to be in safe hands with Falcon Energy and can expect the very best, professional service. We'll offer invaluable, insightful advice at the very start of a project, big or small, domestic or commercial, and our team will work closely with you and any architects or builders to ensure a pass is achieved. Our nationwide services are second to none and can be completed at a time to suit you. What's more, our air permeability testing is reliable and cost effective; what's not to love? When is my property ready for air tightness testing? Although testing cannot be undertaken until the property or properties are completed, instructing a qualified tester should be considered at the beginning of the project at the planning stage. This is because if a knowledgeable energy company, such as Falcon Energy, are consulted from the beginning, then we can help to suggest best practices for energy efficiency at an earlier stage. This ensures that once the build is complete, it has a far higher chance of passing. As soon as the build is complete, then air tightness testing can begin. To find out more about the process involved with air tightness testing, read our blog. Why are homes built to be airtight? To reduce air leakage of a building and to lower the results of the air tightness test. This reduces the amount of energy required to maintain comfort levels and in turn, reduces carbon dioxide emissions from heating. Having an airtight home is both environmentally and financially efficient and saves homeowners money in the long term. Why do we test air tightness in domestic properties? Proving the air tightness standard of a building is now required under Part L of the Building Regulations. Domestic energy accounts for more than 25% of the UK's CO2 emissions, which the UK Government aims to reduce overall. As a result, it’s an important certification for developers in new build projects. What’s our process for measuring air pressure? 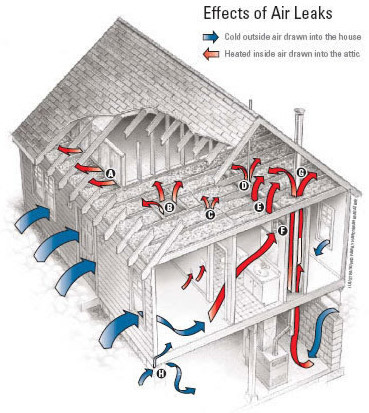 Air Leakage in buildings is measured by installing a large fan temporarily on-site to measure the pressure differential across the envelope of the property. Throughout the test, the fan is used to gradually increase and decrease the pressure, which allows for a range of pressure and environmental readings to take place. The differential pressure is recorded between 25-70Pa (Pa is the unit of measurement for air pressure - ‘pascal’). 50Pa is the required air flow differential, so the total airflow needed to achieve this is calculated and divided by the total building envelope. This results in a leakage rate (m3/h/m2@50Pa). What are air leakage paths? They’re the opposite of controlled air flow that you might experience with purpose built ventilators that result in desired air flow. Air leakage paths are uncontrolled air flows and are undesired. These instances can occur through cracks in a building’s fabric, or even gaps. Once these paths are discovered, they should be fixed to reduce or stop air leakage. For a free, no obligation quote on air tightness testing for your residential or commercial property, or to simply discuss your requirements, call us now on 01403 253439 or email info@falconenergy.co.uk. Alternatively, fill out our contact form and a member of the Falcon Energy team will be in touch.